This morning led us to several verses to look up. Basically, today we have been learning that satan is alive, active and the father of all lies; he is very subtle and deceptive in his tactics to lure us into sin. ON GUARD-hold that shield up! 2 Corinthians 11:14 - Satan disguises himself as an angel of light! Be on Guard! "satan" singular word that we wrestle and fight against, it is "satan and his demons"plural word - demons! 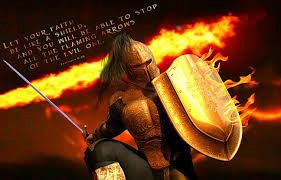 If we wrestle against so many evil forces/devils, it only goes to show us how much more we need the Word of God and the Holy Spirit of God to empower and strengthen us to be able to stand against "all of them" and live a victorious and happy life. 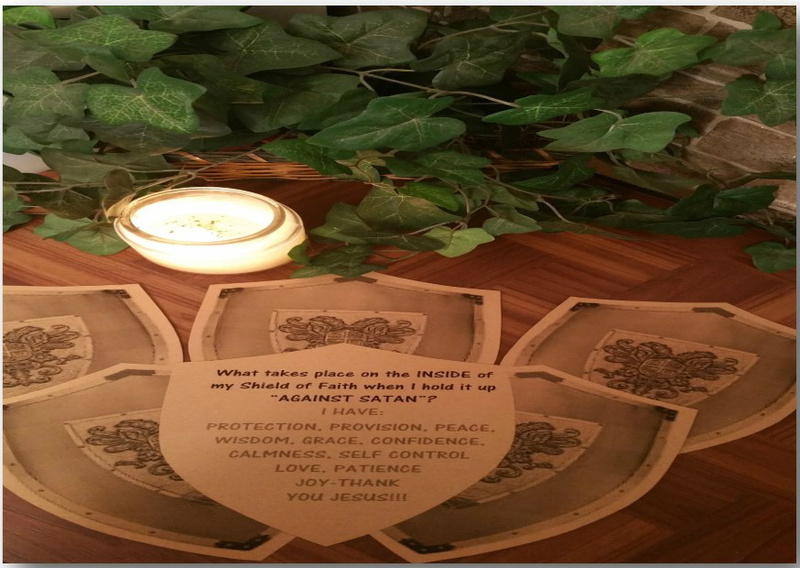 Satan knows he can't destroy us, so he does his best to make our time on earth unproductive and to suffocate us with fear, anxiety, depression, worry, lack, sickness, discouragement, grief, etc. End of story... we win! He has been disarmed, overruled, rendered powerless in all his hard works .. 1 John 3:8(b) The reason the Son of God appeared was to destroy the works of the devil. Page 21 in our workbook reveals all the various names of satan and how he works through them, check them out. Thankful to share the Word of God. SELF CONTROL, LOVE, HEALTH/HEALING PATIENCE, JOY- THANK YOU JESUS!!! 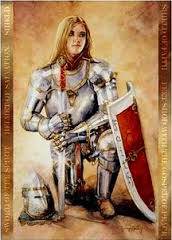 Why do you think Paul chose to associate salvation with this particular piece of armor (Helmet of Salvation)? In what sense do you think our salvation can act as a protective measure for our mind? Read Ephesians 1:10-12 – Discuss phrases that stand out to you. According to this verse: What have we received? How did we come to be recipients of it? How have your emotional health and behavior choices reflected any patterns of defective thinking that the enemy has suggested and that you have perpetrated? What adjectives would you use to describe how a soldier would feel going into battle without a helmet? Romans 12:2 fill in blanks on page 166 in work book together. Ø Receiving salvation is not the same as applying salvation. Ø The first “redeems us” and the second “restores and protects us” and shields us daily from the attacks of the enemy. Ø The fact that He lives means our salvation flows into the everyday experiences where we live. As James 1:21 says, our “souls” are saved daily and progressively through the Spirit and the Word of God. This is sanctification and it is how we are able to experience the abundant life that Christ came to give all who believe on His name. Ø Sanctification is a “process” by which we are continually delivered from the wrath of God on earth, fortified against the enemy’s attacks, and molded into the image of Christ as our minds are renewed. Ø Salvation is the rescue from a state of danger and the restoration to wholeness and prosperity. Ø Our God’s salvation involves the well-being of the whole person, not just rescuing them but even reversing negative circumstances. Ø A Roman soldier’s helmet was basically a skullcap made of iron, typically covered with bronze. Its primary function was to protect the soldier’s skull and brain from the swing of the “broadsword” a three to four-foot-long sword with a massive handle that needed to be cradled by two hands to hit its target. Ø Over time, the soldier’s helmet was redesigned to give even more coverage. It protected not only the head but also the neck and shoulders. When the helmet was strapped in place, it exposed little besides the eyes, nose, and mouth. Ø This helmet of salvation, positioned to a snug fit, is representative of the high-value items that are ours “in Him”, our inheritance in Christ. Choosing not to wear it means leaving our mind exposed, unprotected, like people who don’t even own a helmet. Ø Every single function of your body, whether just a small movement of your pinkie finger to operating a car or running a marathon- is attached to the signals and impulses your brain sends. If your brain is impaired, your body will also be impaired, no matter how healthy the individual parts of your body may be. Ø What the brain is to the body, your mind is to your soul. Ø The brain is the control center. Ø If your mind doesn’t send out healthy impulses, your souls will not respond in healthy ways. This is why the enemy works so diligently to cripple you through negative thoughts and unhealthy patterns of imagination. Ø If your mind’s thought processes are unhealthy and toxic, your emotions and actions will expose it. Ø Poisonous thinking will also cripple your ability to clearly detect the leading of God’s Spirit. As an heir, you’re meant to know and discern His will, to hear His guiding voice behind you. Ø The enemy’s lies, when believed, short-circuit and distort your ability to hear God’s voice clearly and respond accordingly. Ø Thoughts occupy mental real estate. Thoughts are active; they grow and change…. Every time you have a thought, it is actively changing your brain and your body; for better or worse. Ø Step #1- Identify the toxic though patterns you’ve been nursing and recognize them for what they are – strongholds. A stronghold in biblical times was a military fortress, nearly every ancient city had one. Ø Step #2 – Confess errant thought processes to God and agree with Him about your responsibility in helping to construct these strongholds in your life. Ø Our strongholds are not all the enemy’s fault. Every tie we’ve nursed and rehearses illegitimate thinking, we’ve added another concrete brick to the construction of a stronghold. Rehearsing the enemy’s lies made us in essence a partner with the enemy in building up a fortress that has held us captive. Ø Step #3 – Dismantle the stronghold by taking your thoughts captive, then renewing your perspective and understanding through the concentrated, deliberate applying of God’s truth. Ø This is not a passive assignment, it requires forethought and proactivity. Ø When Paul instructed us to “take every thought captive” he employed a tone that expresses “continuous” ongoing action. So we must understand that being successful at this endeavor will be a “LIFESTYLE”, NOT a one-time event. Ø Taking thoughts captive means controlling them instead of them controlling you. Ø Resist the urge to agree with or rehearse the negative thoughts. Instead, replace it repeatedly, diligently, and verbally, until eventually that brick in our stronghold comes tumbling down! Ø Your identity is your weaponry. Putting on the helmet of your salvation is akin to knowing who you are in Christ, fortifying your thinking. Ø Renewing our minds and deflecting the enemy’s advances to control them is not for the faint hearted. It REQUIRES vigilance, aggressive, proactive attention. Ø The fact is – when you are in a war, you don’t relax or disengage from active warfare. You don’t take a vacation. You do whatever you need to do to keep that helmet on and in position throughout every day. Ø You “talk of them when you sit in your house, when you walk by the way, when you lie down and when you rise up. You bind them on your forehead. Duet. 6:7-9…You shall write them on the doorposts of your house and on your gates.